Home » Parking and travel » Travel, transport and road safety » Breeze up to the Downs! Breeze up to the Downs! To check how the buses are running, please go to the Brighton & Hove Buses website, phone 01273 886200 or contact them on Twitter. Service 77: Unfortunately the Devil’s Dyke service will need to be suspended until the 12.45pm departure from Brighton Palace Pier, which will actually start from Old Steine stop Q. For the rest of the day, buses will start from Old Steine at stop Q, and will run via North Street (instead of the seafront) to Churchill Square, where they resume normal route. Brighton Palace Pier, Ship Street, the i360 and Clarence Square cannot be served during this time. Towards the city centre, buses will follow their normal route but will terminate in Old Steine. The first departure from Devil’s Dyke will be at 13.22. Service 78: Unfortunately the Stanmer Park service will need to be suspended until the 13.00 departure from Old Steine. However a bus will run from Lewes Road Bus Garage at 12.17. The first departure from Stanmer Village will be at 12.33. Service 79: Unfortunately the Ditchling Beacon service will need to be suspended until the 12.15pm departure from Old Steine. The first departure from Ditchling Beacon will be at 12.45. 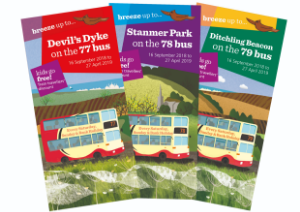 Breeze up to the Downs is a network of three bus services 77, 78 and 79. The buses link the city with some of its most popular countryside destinations within the South Downs National Park and Stanmer Park. These services are provided by a partnership between Brighton & Hove City Council, The National Trust, the South Downs National Park Authority and Brighton & Hove Buses. Did you know you can breeze up to the Downs every Saturday, Sunday and bank holiday except Christmas Day? The 77, 78 and 79 buses to Devil’s Dyke, Stanmer Park and Ditching Beacon will get you out to the stunning South Downs from the city centre in fewer than 30 minutes. Bus services 77 to Devil’s Dyke, 78 to Stanmer Park and 79 to Ditchling Beacon will run every weekend and on bank holidays. Bus service 77 to Devil’s Dyke will run every Saturday and Sunday – but will run seven days a week from 17 June until 31 August. Bus services 78 and 79 to Stanmer Park and Ditchling Beacon will run every Saturday, Sunday and bank holiday. Return tickets can be used to return from Devil's Dyke, Stanmer Park or Ditchling Beacon: so they are ideal for walkers too! Special return fare of £3 on Service 79 to Ditchling Beacon from any bus stop on Ditchling Road. £2 single or return from Tongdean Lane (on Dyke Road Avenue) to Devil's Dyke. Bus Pass holders travel free. Up to two children per adult travel free. To encourage people from further afield not to drive to the area, people arriving by train can buy two single or return journeys for the price of one. If you're travelling on your own you can get a third off the bus fare. Just show your rail tickets to the bus driver to take advantage of this great offer. Please note your train tickets must be valid for travel to Brighton or Hove. This special offer does not apply to 'SAVER' or Discovery tickets. The South Downs National Park has produced a variety of publications that offer information on walks and cycle rides, places to visit and eat, and upcoming events. Check the South Downs National Park website for more information. Please contact us if you would like us to send you a set of these leaflets at transport.projects@brighton-hove.gov.uk or phone 01273 292480.